After the birth of her first child in 1986, Cynthia began five years of work in Hawaii with mothers and children birth to age three: first, developing a parent/child program called Babies By The Sea and also, work as a Child Development Specialist, training outreach workers in child development. Her work also involved home visits with mothers from many cultural backgrounds who were at risk for abuse and neglect. She assisted them in learning about their newborn or infant. This included baby care, feeding, play and setting up their home environment. She also taught how to read baby’s cues and ways to strengthen their bond with their baby. Since moving to the Blue Ridge, Cynthia has been working continuously with families in several different capacities. First, the parent/child group she began in 1996 and currently teaches called Montessori Open Mornings, a program for parents and newborns to age three. Second, in 2002 she began The Village Playhouse off the Downtown Mall. For two years this venue served as a coffeehouse style setting for parents to come and relax with their young children and for parents and children to attend various classes or family events that were held in the Playhouse. In addition, Cynthia taught preschool at Free Union Country School for three years. 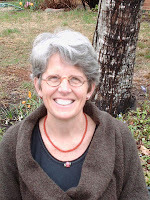 Then in 2006 she began her current work: teaching a small group of children age three and younger in her home. At that time she also began her work as a postpartum doula for Month10 and is a certified postpartum doula with DONA (Doulas of North America).